For over a decade now, FromSoftware has crafted a specific style of game. However different their names, settings, tech, or console generation might be, you could always rely on the Japanese studio to produce a particular experience yet to be replicated by any other team. Every new From game would change just enough to keep things fresh, but never stray away from the original design many of us have fallen in love with. It wasn’t until Bloodborne that the studio attempted the first genuine break from that mould, but even then, the game shared much of its DNA with Souls. For me at least, that formula never overstayed its welcome; it never became stale. This makes Sekiro: Shadows Die Twice a different prospect. For one, it upends two core components of Souls: combat, and player movement. 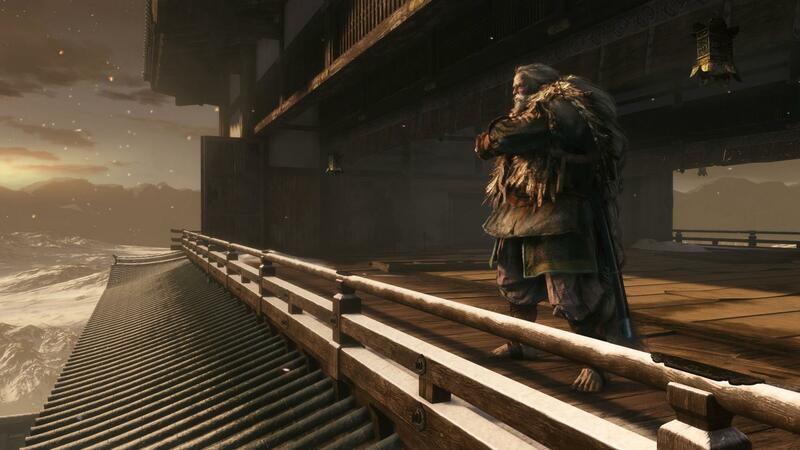 The difference is so stark Sekiro often feels like a fan game that wants to be defined by more than its inspirations. Sekiro retains From’s exceptional level design, storytelling techniques, and even minute details like scene framing, and level transitions – but it plays nothing like the games that made the studio a household name in recent years. 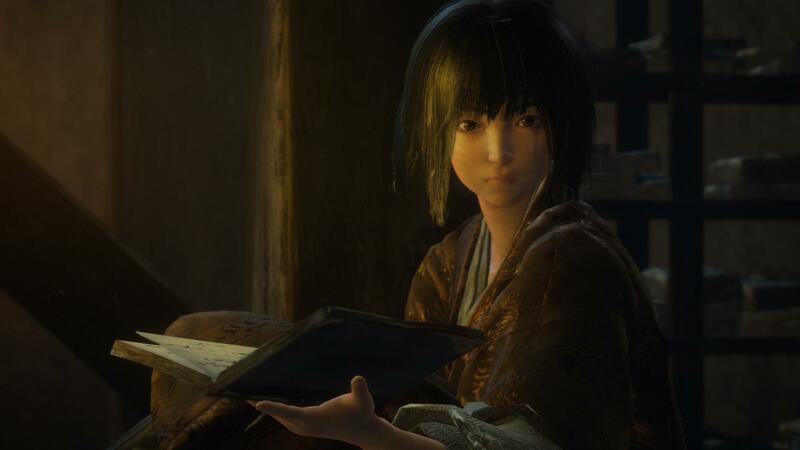 Sekiro’s opening hours left me with a strange realisation; playing so many Souls games was my biggest handicap, a hindrance to my ability to take in the lessons Sekiro wanted to teach. Tutorials or not, most of us just lean back on old routines when playing games, and that is no less true for challenging games. I played Dark Souls from behind a shield, blocking most of the time and dodging when that didn’t work. It wasn’t until Bloodborne forced me to get familiar with the dodge button that I came to appreciate that agile approach. I would later revisit Dark Souls games with renewed confidence, abandoning my old ways in favour of the more confident style I enjoyed in Bloodborne. Bloodborne’s crucial parrying mechanic was thought of as essential; something you had to learn – or master – to do well at it. But many finished the game without having to ever got to grips with the timing of the trigger pull; much in the same way most probably never incorporated Weapon Arts into their regular combat techniques in Dark Souls 3. Whittling down enemies’ health, one hit at a time, continued to be a valid way to make progress. If something proved too difficult, an hour or so of farming the same enemies was enough to give you a necessary bump in stats, increasing your damage or HP. When all else failed, you could always rely on the help of a friend or stranger anytime you got truly stumped. This is how roadblocks were eschewed in all those games. Many would even agree that these – let’s call them crutch systems – were indispensable to the FromSoftware formula, the studio’s way of offering an easy mode in disguise. There’s all this baggage of expectations and muscle memory that I couldn’t help but bring into my first few hours of Sekiro, which the game nonchalantly set aside almost from the outset, as if to loudly exclaim how indifferent it is about all my past experiences. It’s clear Sekiro’s rhythm is decidedly un-Souls. It shouldn’t take long to see that, but somehow being a Souls veteran made that difficult. Nevertheless, the game seemingly knows this, and it is willing to go to extraordinary lengths to demonstrate its unique identity. My first roadblock wasn’t a boss fight or a specific enemy encounter; it was upon realising my character had zero invincibility frames on dodges. With Sekiro being a faster, more aggressive game, I immediately resorted to dodging attacks as much as possible. I was still leaning on my old habits, and Sekiro wasn’t having any of it. Enemy attacks in Sekiro have superior tracking compared to Soulsborne, invalidating my dodge spam approach almost immediately. Countless confusing deaths later, I decided to perform an experiment; to see if dodging was truly borked. To my surprise, it turned out that iframes do exist, except they’re much less forgiving. Combined with better enemy tracking, Sekiro was evidently pushing me to master its block and deflection mechanics. Dodging, while useful, is in this case designed to help you re-position, not evade. In hindsight, deflection makes up the entire core of Sekiro’s combat, but I didn’t view it that way until my old tricks failed to save me. Only when engaging with these mechanics that I realised Sekiro’s deflection timing is actually very forgiving, just like dodges were in Bloodborne. So, I started deflecting as many attacks as I could; I became in tune with Sekiro’s rhythm of clashing swords. For a while, I thought I had figured it out, until it came time for the second lesson: deflection isn’t everything. Sekiro’s first major boss fight is practically designed to drill that into your brain. The boss is aggressive, consistently deflects your attacks, and doesn’t offer you the wide window regular enemies do to retaliate or even recuperate. If you’re spamming the button, you’ll likely deflect some and block the rest, and you’ll end up with a stacked posture bar, forcing you to disengage and create distance. As soon as you go on the defensive, the boss’ posture quickly recovers, nullifying all your work. This was probably the height of my frustration with the game. I thought I was doing what it asked, but all I got was failure. I spent hours fighting that boss without making any progress. The key to that fight is understanding that it’s not just a game of timing deflects. That boss shows this very clearly with wide swipes that often hit you from the sides, which you can either anticipate and punish, or quickly turn to react – only one of those leads to a win. 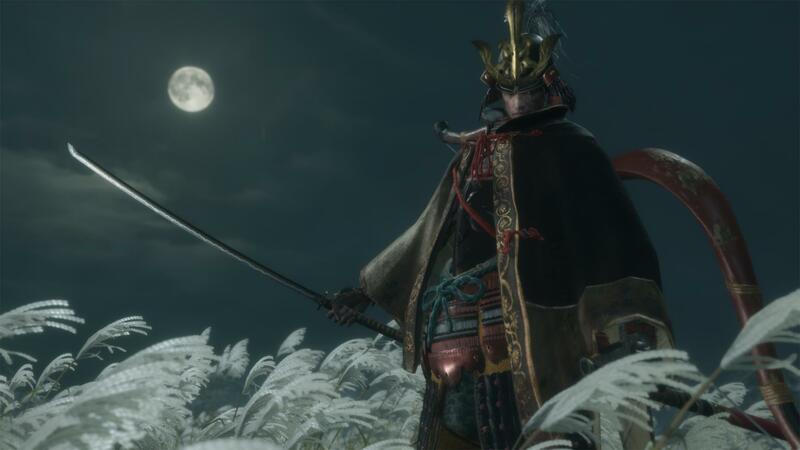 But, given the harsh lessons from the game’s opening hours, it didn’t occur to me that maybe there’s more depth to Sekiro’s combat. This was the first time I had to prioritise vitality damage, as I began to understand how low HP affects posture. It sounds incredibly basic now, but it took me time to wrap my head around. I have a feeling that particular boss will be the end point for a lot of playthroughs. This is where Sekiro will either click, or frustrate players beyond what they can tolerate – even by Soulsborne standards. I also suspect many will find it impossible now that character levelling, and co-op – the old crutch mechanics – are gone. As corny as it sounds, FromSoftware created a game where the only way to make progress is to get better. Before I learned those lessons, I decided to explore the game’s other mechanics in search of a crutch – or something resembling it, at least. It soon became clear that Sekiro does have those, but they’re not quite what I expected. The game’s stealth system is perhaps the most obvious example. Though its rules can be inconsistent, it is heavily weighted in the player’s favour. As long as you can maintain stealth, you can essentially take out everyone you need to. If your cover is blown, breaking line of sight for a few seconds is often all you need for enemies to return to their neutral state. In fact, if you ignore the sheer damage you can inflict silently, Sekiro’s stealth is often enough to let you bypass entire areas altogether. Of course, stealth won’t work on bosses, which is where Shinobi Prosthetics come in. Firecrackers will stun them, giving you a window to attack or retreat, and the Loaded Umbrella can be your shield in a pinch. More advanced Prosthetics like the Mist Raven will have you phasing through long attack animations to land behind them for an easy hit, and a well-placed Shuriken can interrupt the more elaborate moves. Creative use of Prosthetics has given me a leg up more times than I can count, but just like deflection, it’s a mechanic designed to be actively engaged with, not to simply prop up your existing repertoire. My time with Sekiro has been a rollercoaster of emotions. The 45 hours it took me to finish it left me with an undeniable mastery of its systems, but more frustrations than any other game I can remember. I still can’t decide if Sekiro is too cruel for making me go through its trials, or ingenious for being this engaging throughout it all that I couldn’t help but push through.